For all of the materials you need to complete all stencil projects, check out our Stencil Supplies list. For quick tutorials on how to stencil check out our website or YouTube page for more details! Finally, a great wall stencil design for kitchens! Of course, you can use this stencil in other rooms too, such as bath, bedroom and hallway. Perfect for nurseries, too! 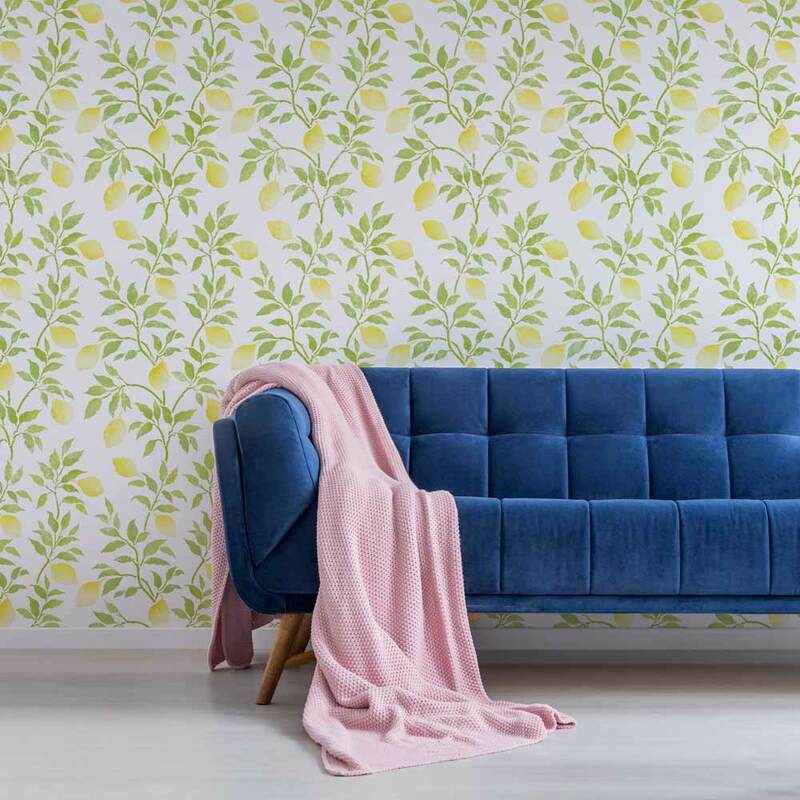 Now with the help of our Lemons Allover Stencil and some acrylic or latex paint, your walls can be transformed into a serene lemon grove. Unlike pricey lemons wallpaper, our reusable stencil offers you an opportunity to choose your own color combinations and to be creative. Our Orange Grove stencil is right on trend! 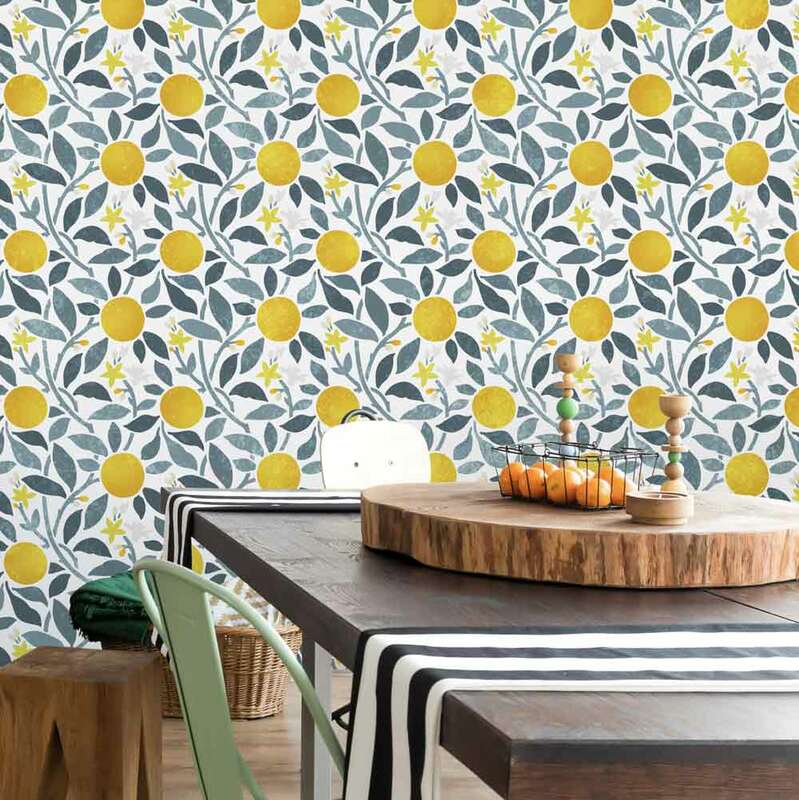 Florals, fruit stencils and botanicals are everywhere and we really liking the citrus craze! Like the Lemons, this design is also perfect for kitchens or even a bathroom! This stencil pattern fits perfectly in a farmhouse style home or even something a little more modern! Our Sweet Roses Wall stencil is a perfect choice for a romantic feminine bedroom or a nursery! 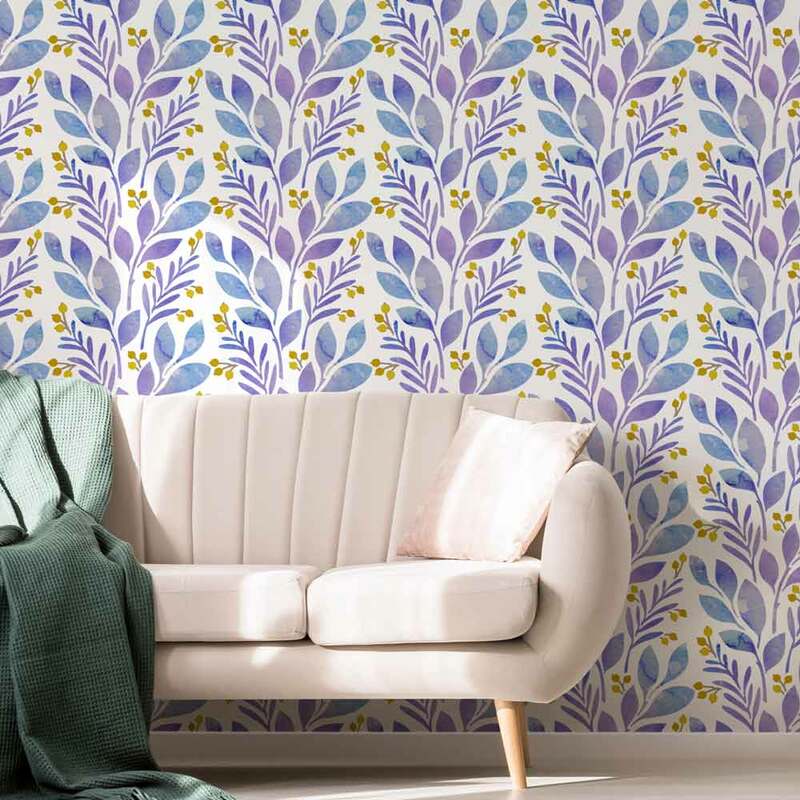 Florals and botanicals are everywhere and we’re especially fond of large florals and watercolor flowers. 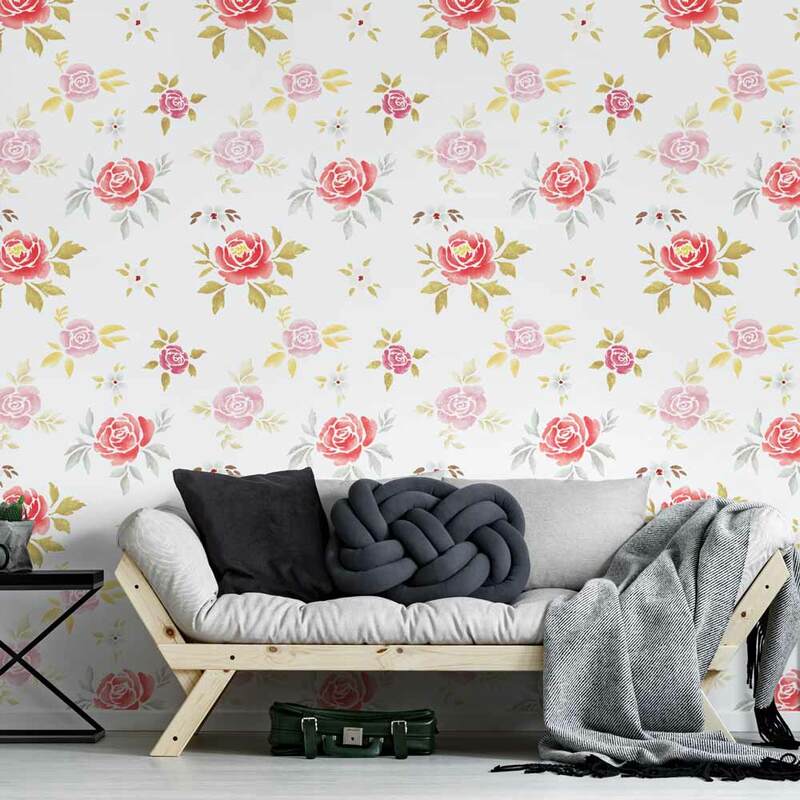 Now with the help of our botanical floral stencil and some acrylic or latex paint, your walls can be transformed into a dreamy rose garden. This Garden Bouquet Allover stencil is created by stencil designer Janna Makaeva and is exclusive to Cutting Edge Stencils. While it takes a stencil artist to draw a good stencil, stenciling itself is an easy painting technique that doesn’t require any artistic ability. As long as you can hold a brush or a roller, you’re pretty much good to stencil! This stencil design can be painted with a foam roller and/or stencil brushes, depending if you want it in one color or multi-color. If you’re looking to achieve a watercolor look with your stencil, please use a floating/glazing medium (sold in craft stores) mixed with your paint, to add translucency. Please watch our videos to learn an easy stenciling watercolor technique. 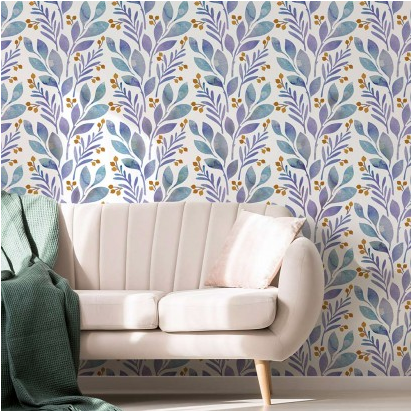 Our Magnolia and Berries Wall stencil is perfect for modern farmhouse interiors: nurseries, bathroom walls, kitchens and dining rooms. Branches, twigs, berries and botanicals have become very popular and we happily see them everywhere!This stencil design can be painted with a foam roller and/or stencil brushes, depending if you want it in one color or multi-color. 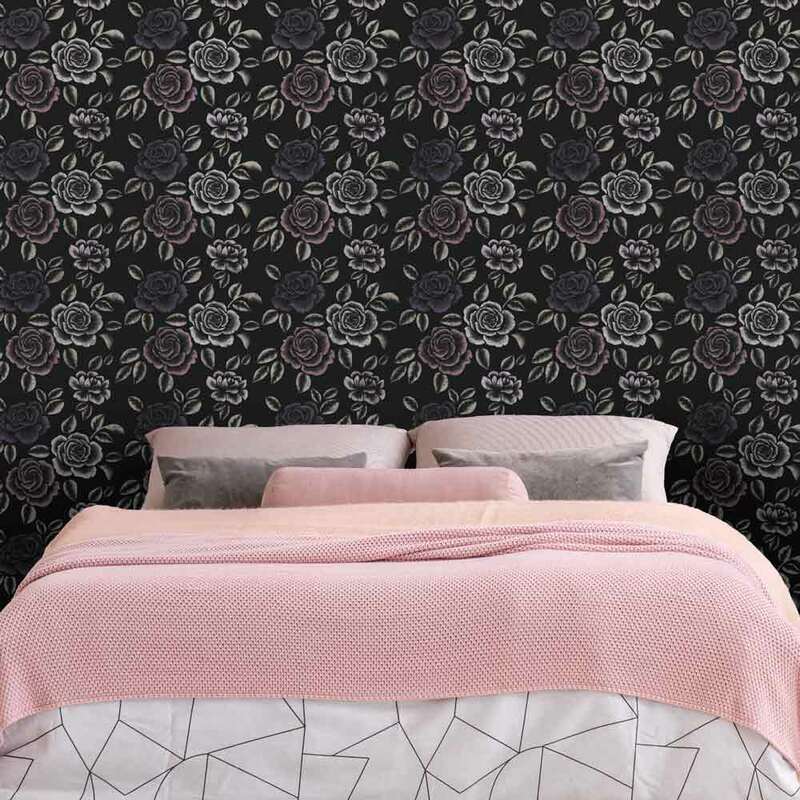 Our Midnight Rose Garden stencil is right on trend! 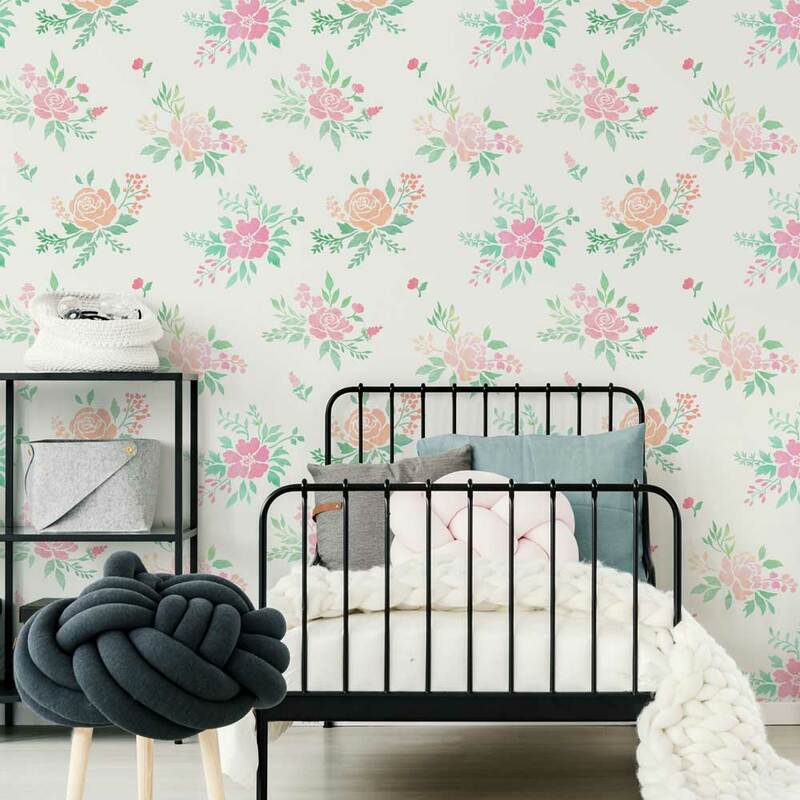 Florals and botanicals are everywhere and we’re especially fond of “Dark botanicals” and “Dark floral” trend, when the plants and blossoms are stenciled on a darker background! Now with the help of our beautiful rose stencil and some acrylic or latex paint, your walls can be transformed into a enchanted rose garden. If you’d like to create a shimmering effect and give your stenciled roses a beautiful glow, please use metallic paint and the stencil brush. Try shading only the outer edges of petals and leaves, this way the creases stay dark. Please watch our instructional videos to learn this easy stenciling technique. Check out our Facebook Page to see our beautiful customer photos and interact with the people who created them! Feeling inspired? Check out our other Blog posts for more insporation and stencil designs! Stenciling a Paneled Wall ~ Yes, It’s Possible!